I met Ayla Schlosser a couple of years ago at a conference at the UN. Ayla had already started her ground-breaking organization called Resonate, which helps women gain strength and confidence through storytelling. From the very start, Ayla’s passion has shown through. She is a social entrepreneur through and through and I admire her greatly. I hope to one day, be able to visit Rwanda and see Ayla in action. Resonate uses storytelling to empower women and girls to build self-confidence and unlock leadership potential. We believe that, in addition to external skills, women also need the internal resources to be agents of change in their lives and their communities. The confidence gap exists globally – and in Rwanda and throughout East Africa that gap translates to missed opportunities for social and economic advancement. 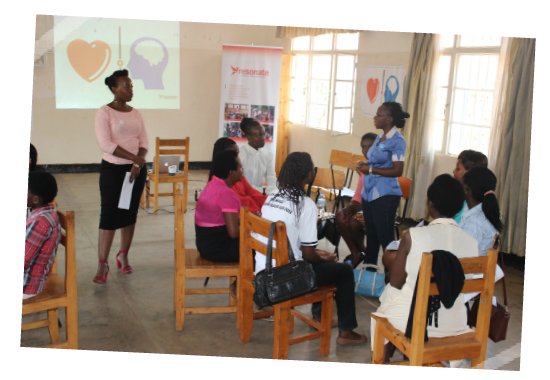 We partner with organizations teaching skills and education, and integrate our leadership training into their programs. Through this combination women not only get access to the skills and tools they need, they also develop the confidence and leadership to put those skills to use. What inspired you to start Resonate? Tell us about your personal journey which brought you here. I grew up in a household with a strong feminist mother, a supportive father, and with the understanding that I could do anything I put my mind to. I got good grades, I played sports, I stood up for my friends, and I loudly voiced my opinions. I considered myself strong and in control. Yet I was unable to recognize or admit to myself or others that I was in an abusive relationship during college until almost 7 years after it ended. I was able to extricate myself from that relationship, but it changed my perception of strength and the origin of confidence. Despite my comfortable upbringing and feminist values, as a 20-year-old I didn’t have the ability to stand up for myself. It wasn’t until I discovered the Storytelling for Leadership framework while working as a community organizer that I was able to fully understand the difference between standing up for an idea, and having the confidence to stand up for myself, and I knew that I couldn’t keep that important revelation to myself. We know that it is smart economics to invest in women, and that they have the potential to be drivers for social and economic development. Yet providing access to skills is not enough; in addition to hard skills and education women also need the internal resources required to take action. I want to contribute to a world in which every woman is confident and empowered to reach her full potential, and to create the changes that she wants to see in her own life, her family, and her community. Why Rwanda? Had you ever been before or did you arrive for the first time with the purpose to stay on? After learning about the Storytelling for Leadership model in the US, I was intrigued by the power of the tool, and eager to use it to unlock the biggest pool of latent leadership potential: women in the developing world. When I discovered that no other organizations were using this model for women’s empowerment I knew I had to try it. I decided to pilot the program in Rwanda because of it’s unique situation regarding women’s leadership. 64% of Rwanda’s lower parliament is female – yet on a local level women are underrepresented in leadership roles. Resonate’s programs are designed to move participants from opportunity to action, and this is an incredible environment to demonstrate what is possible when top-down policies are coupled with grassroots efforts to close gender gaps. Tell me about your initial steps to create Resonate. Shortly after moving to Rwanda to pilot Resonate I met my co-founder, Solange Impanoyimana. Our backgrounds were incredibly different, but we had both independently arrived at the same passion: supporting women to reach their full potential. Solange was instrumental in helping me adapt US community organizing tools to the Rwandan context, and together we built out a program that suits the needs of our end-users. What advice can you offer someone who is looking to make a positive change in this world? Believe in yourself: We engage in our work with confidence, knowing that each of us brings unique skills to the table. We see strength in authenticity and lead with the best, most honest version of ourselves. Each of us has a unique capacity to make change, but the first step to doing so is recognizing our strengths and believing that we can. It sounds simple, but it’s supremely important, and it’s the same spirit we are trying to cultivate with the women we work with in our programs. If we allow the magnitude of the problems in our world to stop us before we even get started, we will never find solutions. There is no perfect time, and no perfect way…the most important thing is to just get started. Or as we might say at Resonate…be like the hummingbird. Did you know Resonate was going to be your end goal or was it an evolution through trial and error? When I started Resonate really didn’t know what I was getting myself into. I had a crazy idea a way to use a proven methodology in a new context, and really didn’t know whether or not it would work. 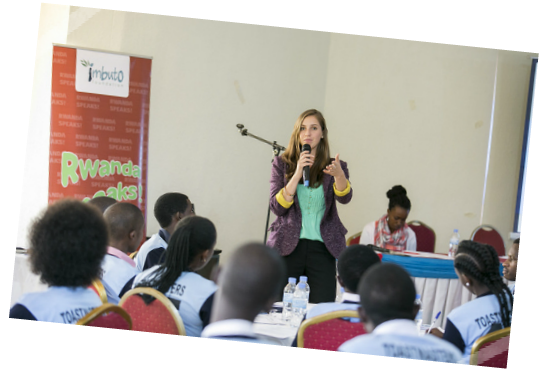 When I first moved to Rwanda I planned to go for six months for a pilot program…now it has been 3.5 years and we have conducted leadership training with more than 2,500 participants across East Africa! Tell us about some of the positive impact Resonate has had…the fruits of your labor, so to speak…inspirational stories. To me, the best part of my work is hearing the stories of the women we work with. As an example, we worked with a community in a coffee-growing region in Rwanda that had never had a female council member. Six months after our training two of our program graduates, Francine and Caritas, ran for and were elected to village council. Another past participant, Egidie, gained the confidence to start a shoe business and provide for her family, while Josette used her story to persuade a hospital to let her adopt a baby girl. Diane broke a long period of unemployment by using her story to win a prestigious job at UNHCR, and Aline now speaks so confidently about herself that she was offered a job at UAP Insurance. As these examples show, Resonate’s alumnae start businesses, join the workforce or improve their pay, join or start savings groups, put their children back in school, and invest in land purchases– to name just a few of the positive outcomes of our programs. Our success is in our ability to support the positive changes that our participants make in their own lives and communities. Hear participants talking about their experience with the program here. Describe a Resonate workshop for us. Identify Values. By examining how those values influenced choices in their lives, participants see themselves as agents of change in the trajectories of their lives. Personal Story. Participants take one of those moments and use it to tell a personal story of a time when they have overcome challenge – after our redefinition of leadership this allows them to see and talk about themselves as leaders. Inspire Action. Finally, participants learn to use that story as a way to get support or inspire action in an academic setting, community, or professional environment. What are your next steps on your journey? What goals do you have for yourself? We have big goals for Resonate in 2017. After three years of operations we are still a startup, but it’s time for us to start getting serious about our long-term planning. We are embarking on a 3-year strategic planning process, and through our participation in the GSBI Accelerator build the systems and infrastructure necessary to scale our programs throughout East Africa and support more women leading change. I hope you enjoyed this read! This entry was posted on February 15, 2017 by dvblogAdmin.